As early as 5000 years ago the Inca, high up in the Andes of South America, started domesticating the alpaca. Alpacas were hailed by the Incas as a “gift from the gods” – their exquisite fleece so fine and silky, that only royalty was afforded the luxury of wearing cloth made by their wool. When the Spanish conquered South America, they failed to see the value of alpaca fibre; they preferred sheep’s wool from Europe. In the mid-1800’s the value of alpaca fibre was ‘re-discovered’. Textiles made of alpaca fibre have made their mark in the fashion industry across Europe. Today the centre of the alpaca textile industry is in Arequipa, Peru. Yarn and other products from alpaca fibre are sold mainly in Japan and Europe. 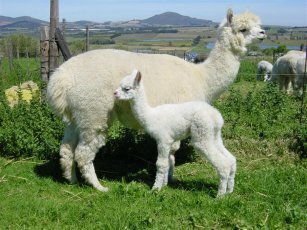 Alpaca are a camelid species, related, among other, to llamas and vicuñas, as well as bactrian and dromedary camels in the Far East. Llamas are used to transport small loads and are very hardy. Indigenous to South America, the number of alpacas found in other countries is increasing. It is estimated that there are around three million alpacas found all over the world, of which 99% live in Peru, Chile and Bolivia. 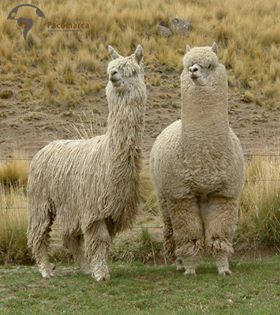 A grown alpaca produces enough fleece each year to create several soft, warm scarves; the yield is between 2 to 4kg. They are shorn once a year, without causing injury to the animal. The fleece comes in about 22 basic colours with many hues / variations, i.e black, grey / rose grey, light / dark brown, a variety of fawn and white. A photo from Pacomarca that beautifully illustrates the difference between a Suri (left) and a Huacaya (right).